Floating Market in Bangkok. There are quite a few markets to choose from in Bangkok, but the Damnoen Saduak Floating Market is the largest and most popular & is located about 100 kilometres (62 mi) southwest of Bangkok. This trip also takes you on a Rose Garden tour in Bangkok. 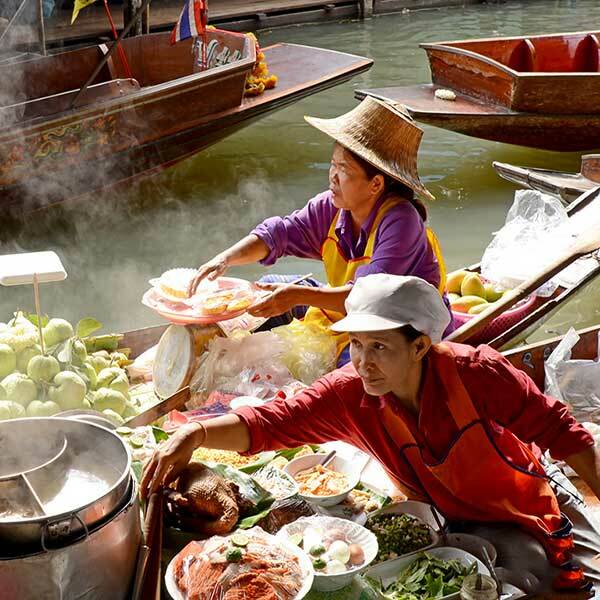 The Floating Market in Bangkok was initially opened up as an attraction for travelers both local and from all over the world, also considered to be the most famous floating market. This Market is a labyrinth of of small canals, and you travel by boat. The women shop owners & sellers, usually wear traditional clothing while they work, & most of the time the food sold comes directly from farms. Many of the small boats are full of colourful vegetables and fruits and you can get some amazing pictures when you are visiting here. The market is often the busiest in the morning around 7 am to 9 am, and is active until Lunch time. If you are staying in central Bangkok expect the travel time to be roughly 1 hour and 50 minutes each way to and from the Floating Market in Bangkok, a bit of a trip but very much worth it when you get there. This is a real Experience into the rural life of Thai people, and a charm of countryside at Damnoen Saduak Floating Market and enjoy the Thai Village Cultural Show at Rose Garden. Meet your English-speaking guide in the hotel’s lobby. Depart for Damnoen Saduak Floating Market in Bangkok, situated 110 Km. west of Bangkok. Your journey commences with a leisurely drive through rice paddies and salt fields. *The tour continues with a 15 minutes speedboat trip along fruit plantation to see Thai houses and the traditional way of life. Depart floating market to visit the wood carving factory. Then head to Rose Garden Country Resort for buffet lunch. Arrive The rose garden, The village built in the style of Thai Architecture where you will enjoy watching thai culture and thai ceremony such as thai wedding ceremony, Thai Boxing , Sword fighting , and thai folk dance. Depart from Rose Garden to Bangkok. Instead, we will extend our morning Arts and Craft workshop into the afternoon. Morning 10:00 – 12:00 hrs. Afternoon 13:00 – 15:30 hrs. inconvenience and hope your support to Sampran Riverside will contirrue as normal.